Frank Morton not only preserves heirloom seeds, he uses classical plant-breeding techniques to create tasty new varieties. When I moved to Portland four years ago and began frequenting the farmers’ market, it didn’t take me long to become obsessed with Gathering Together Farm’s vegetables. The farm’s stand drew me in with its bounty and its kaleidoscope of color: crisp peppers in green, red, yellow, and purple; fragrant bundles of fresh basil; and singular specimens that I’d never seen before, like watermelon radish and delicata “zeppelin” squash. But it was the lettuce—hulking heads of it, bursting with uncommon vigor—and several types of kale (not just lacinato but White Russian and a frilly magenta-stemmed kale called Red Ursa) that stopped me in my tracks and caused me to exclaim out loud to complete strangers. Before I had ever tasted a nibble of lettuce, I knew Gathering Together Farm was special. What I didn’t know until recently was why some of the farm’s most popular vegetables are unique and uniquely tasty. The wild salad mix, the kale, and the delicata can all be traced directly to one maverick plant breeder named Frank Morton. Little known to the general public, Morton is a rock star in plant breeding circles. A seed saver who grows heirloom plants that are at risk of extinction, Morton is also an organic plant breeder who creates never-before-seen varieties that have improved yield and disease resistance as well as culinary attributes such as texture, color, and enhanced flavor. He’s also an indefatigable activist who sued the U.S. Department of Agricluture in 2008 for failure to require an environmental impact assessment before Roundup Ready sugar beets were introduced in the Willamette Valley. Plant breeders have been overlooked in the local food movement, but they shouldn’t be. 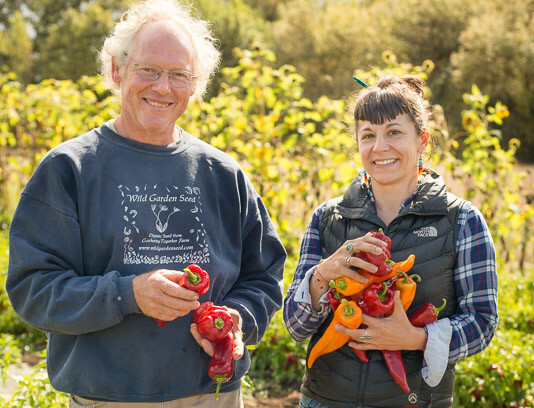 Without them, we wouldn’t have any heirloom tomatoes to delight over at our farmers’ markets or improved varieties like Frank Morton’s addictive Stocky Red Roaster sweet peppers. But what Frank Morton practices is old-fashioned Mendelian crossbreeding, which humans have used for thousands of years. He crosses a plant that has a trait he likes—say, Merlot lettuce, which is resistant to downy mildew—with another plant he also likes—say, Reine d’ Glaces lettuce, which has dark-green lacy leaves and is crispy and sweet—then saves the seeds from this union and plants those the following season. “Frank is the poster boy of good practices when it comes to crop improvement and creating new varieties,” says Matthew Dillon, director of Seed Matters, an initiative from the Clif Bar Family Foundation that’s dedicated to improving and protecting organic seed. (More on this later.) Fifteen years ago, Dillon—then the executive director of Abundant Life Seed Foundation in Port Townsend, Washington—hired Morton and plant breeder John Navazio, PhD, to speak at a seed growers’ conference. “Literally nobody in the seed world was talking about seed improvement then but Frank and John. They were way ahead of the curve,” says Dillon, referring to the practice of improving seeds by breeding plants with desirable characteristics. Morton also preserves genetic diversity by growing plants that are in danger of being lost. Just one example is golden chard, which Morton grew for Abundant Life, and which he still grows for his own seed company, Wild Garden Seed. Morton, who has a round face framed by curly white hair, relishes telling the story of how he first stumbled into plant breeding. It was 1983 and he and his then-girlfriend, Karen, were living on a small farm on Washington’s Kitsap Peninsula, growing organic lettuce for high-end Portland restaurants including Genoa, L’Auberge, and Bread & Ink Café. They even had regular orders from several East Coast restaurants, like the Fountain at the Four Seasons Hotel in Philadelphia. So he did. Because it was late in the year, Morton only got 65 seeds. He naively thought he’d get 65 lettuces that looked exactly like the red oakleaf. When the second generation grew—what’s known as the F2 generation in breeding parlance—Morton was amazed to see new shapes, colors, and textures. What he was seeing was a reassembly of traits from the original parents—including some that were previously invisible because they were genetically recessive. Morton had accidentally started a breeding experiment, and he was hooked. Seeing this rainbow of genetic diversity his first thought was, “‘Aw, man—use this in a salad and people will go crazy!” The chefs he was working with at the time—Pattie Hill at Genoa and Jean-Marie Lacroix at the Fountain in Philadelphia—always wanted something new. Morton’s lettuce breeding project grew so quickly that soon every salad bed at the farm was exclusively for breeding. He and Karen transplanted everything from greenhouse to outdoor beds, and every leaf was individually picked. Because of this harvest style—clipping leaves off instead of harvesting the entire head of lettuce—Morton was able to see each plant from seedling stage to the point when it started bolting and making seeds. Morton’s method was simple: he would place a stick by the plants he wanted to save and at the end of the salad cycle, he’d cull all of the plants that didn’t have sticks by them. (Those could be eaten or sold.) The remaining desirable lettuces, he’d let bolt and then save their seeds. By 1993, their little house was stuffed to the rafters with seeds saved from over a decade of breeding experiments. “One evening, probably while getting a box of seed out of her way, Karen said, ‘If you are going to keep growing seed, we are going to have to start selling some.’” They typed up their first Wild Garden Seed catalog at the kitchen table, making 500 copies at Kinkos. Today, their seeds are sold in 41 countries—from South Africa to Slovenia—and their seeds are repackaged and distributed by seed companies such as Territorial, Johnny’s, and High Mowing. Seed saving is nothing new, of course. Until the early 20th Century, open-pollinated seeds were the only kind of seed available—and farmers the world over saved them, adapting varieties to certain climates and conditions in the process. Pharaohs sent their minions out on seed-collecting expeditions, and four thousand years ago the Code of Hammurabi—the law of ancient Mesopotamia—had specifications on how to pollinate crops and improve the next generation of plants. When Europeans colonized the Americas, they brought with them seeds from their homelands as well as from Asia and Africa. As Charles C. Mann documents in his book 1493: Uncovering the New World Columbus Created, seeds that crossed the ocean with Columbus and other explorers are the reason there are oranges and wheat in the United States, tomatoes in Italy, and chili peppers in Thailand. Thomas Jefferson was an ardent seed saver who collected seeds and cuttings from around the world. He’d plant them in his garden at Monticello, which to this day acts as a living seed bank for unusual species such as Tennis Ball lettuce, Windsor fava beans, and the Marseilles fig. At the beginning of the 20th Century, corn breeders discovered a different breeding process that produced a genetically uniform generation of corn that was both more robust and faster-growing than open-pollinated hybrids. These seeds, called commercial F1 hybrids, yielded so much more corn that farmers turned away from the ancient practice of seed saving. Commercial seed companies began creating F1 hybrids for grains, vegetables, and fruits. Today, five companies control more than 60 percent of all the seeds worldwide—most of which are commercial hybrids. There’s nothing wrong with commercial hybrids per se—and some organic farmers prefer hybrid seeds because they have vigor and uniformity. However, they have one major downside: you can’t save the seeds of hybrids and replant them the following year. Well, you could, but you wouldn’t get the same plant. That’s because a hybrid seed is only “stable” for one generation and it can only be reproduced by the parent lines—which are owned by the large seed companies. This means farmers have to buy seed every year. Seed companies love this “vendor lock-in” because it guarantees profits each year. But it creates an added cost for farmers, who used to save seeds from open-pollinated varieties. And even more sinister, a reliance on commercial hybrid seeds means both a lack of genetic diversity and a lack of food security. “Seeds embody the values of those that create varieties and maintain them. Local seeds embody local knowledge and values related to food, including self-reliance,” explains Morton. Having seeds that don’t breed true—that is, hybrids—means living with the weight of seed insecurity. Morton is passionate about preserving this knowledge. Since the late ’80s, he’s run seed workshops and delivered lectures at the Organic Seed Growers Conference and Organicology, a biennial conference that covers the latest in organic research, policy, and movement-building. But the real work of educating the next generation begins with Morton’s crew at Wild Garden Seed. At the moment, he has eight people working for him. His manager, Hank Keogh, is his right-hand man. “He knows just about everything that I do,” says Morton, who suspects he’ll take over the business in the future. Last year, Keogh ran the whole seed-cleaning operation, teaching seven others how to size lettuce seeds, among other things. “Our motto is ‘everyone must know everything,’” says Morton. And boy, do you want to taste these plants. At Organicology 2015, several of Morton’s varieties were featured on the menu at the “Ark of Taste & Heirlooms of Tomorrow” dinner, including his super-tender lacinato rainbow kale and delicata zeppelin squash (part of a toothsome salad made with Inchelium Red garlic and Purple Karma barley bred by another Oregon breeder). Kale and lettuce are what Morton is known for, but he’s also developing a reputation for his Italian peppers, particularly a sweet one called the Stocky Red Roaster that’s a hit with Portland chefs like Jason French at Ned Ludd. Over the past fifteen years, Morton has also been improving several varieties of quinoa, which he’s adapted to local conditions in the Willamette Valley. A few of Morton’s quinoas—Cherry Vanilla, French Vanilla, and Red Head—performed well in a recent quinoa trial at Washington State University. And guess who funded this trial? Seed Matters. Since 2010, the nonprofit and its partners have spent more than $1.4 million to fund the research of seventeen organic seed breeders, all of them affiliated with either universities or nonprofits. (They’ve also helped launch more than a hundred public seed libraries across the country.) But this year, according to director Matthew Dillon, Seed Matters will fund its first private-sector plant breeder: Frank Morton. This piece originally appeared on Communal Table. Photos by Shawn Linehan. I finally found a safe seed to plant! Your work makes me hopeful and joyous about the future! I am in great hope that more millennials will see the importance of your service to farming and our organic survival.